Bottom line, if you do not already have Stellarium, or have not yet upgraded to Stellarium 10.6.1, go and download the upgrade now. 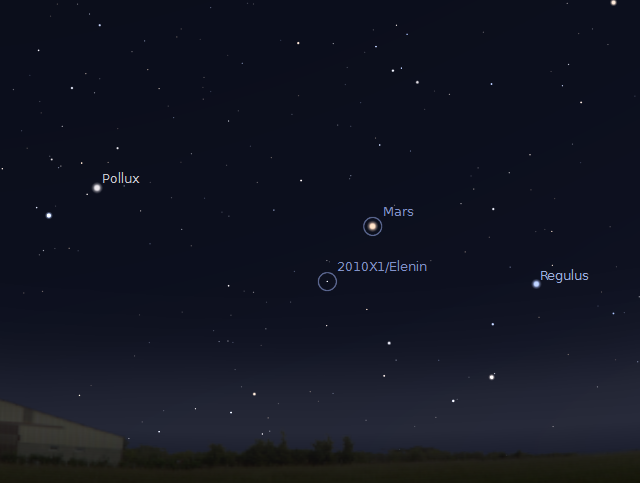 I’ve used the free planetarium program Stellarium since version 0.9, and it is no secret that it is my favourite planetarium program for unaided eye observation, and for illustrating aspects of the sky to school groups and the general public. 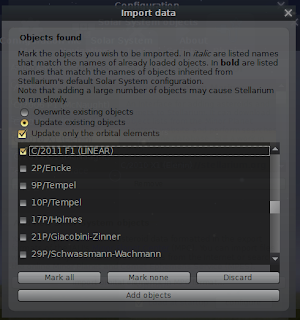 With version 10.6.1 the Stellarium development team have produced a program that I truly love. The first aspect is that Stellarium 10.6.1 (for windows, also versions for Linux and Mac) runs faster on my machine (a less than state of the art Dell Inspirion 1420 with Windows Vista) than the previous 10.5, and more stably. The old 10.5 would very rarely, but randomly, crash for no apparent reason. This version chugs along quite nicely under quite strenuous circumstances. All the old features that make this an excellent planetarium program (photorealistic sky, customisable locations, zoomable objects, large star databases, easy navigation, switching between constellation shapes and plain view, satellite passes, night mode, multiple sky culture maps, ability to see the sky from other planets) are there. The search option is still very sluggish though. All my keyboard shortcuts work as they did before. And what’s more, it has added a feature that makes me almost delirious with joy. 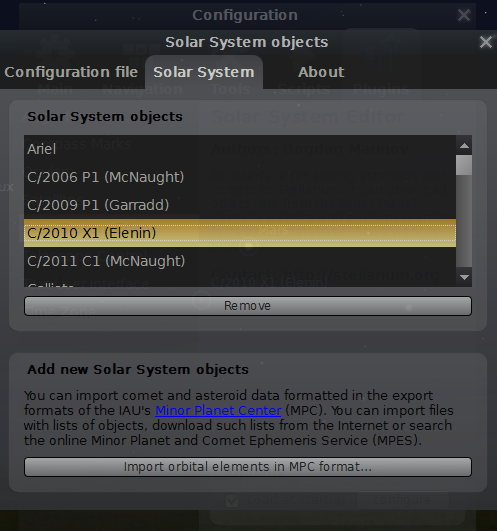 There is a plug-in that lets you download new solar system objects. 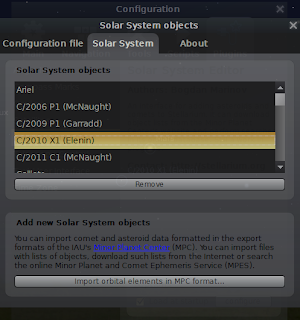 Gone is the laborious hand editing of the system.ini file, you can download new comets and asteroids from online sources, or upload them from files on flash drives (if you are using a field laptop with no internet access. 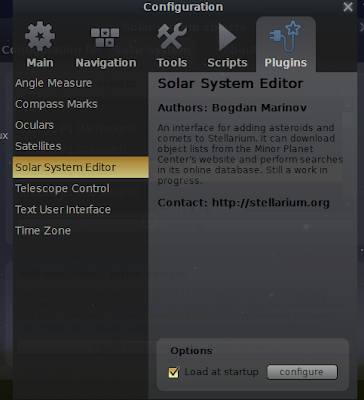 To access the plug-in after downloading Stellarium 10.6.1, press F2 to enter the configuration files, click on the Plug-in tab, then choose solar system editor plugin, click on the load at startup checkbox, then restart Stellarium. After restart, go back to the plugin tab and choose solar system editor, then click on configure. 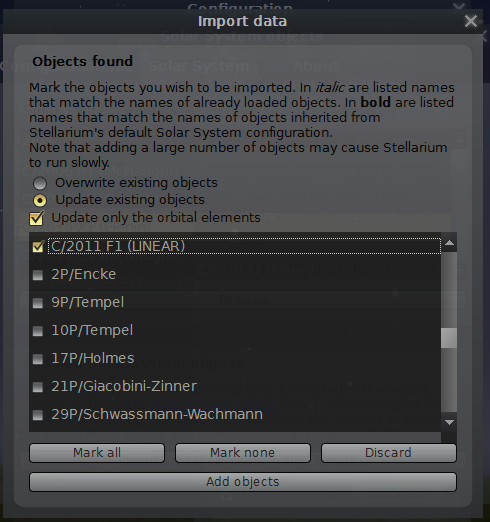 Choose the “solar system” tab and click on “import elements”. 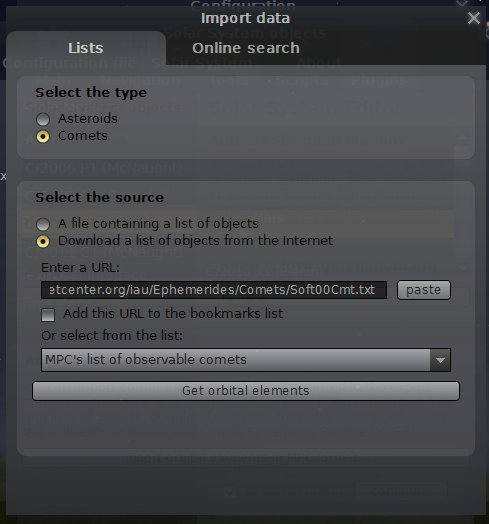 In the next screen choose the “lists” tab, then choose either comets or asteroids. If you are connected to the internet, click on “online list”, then either type a URL manually, or choose from the preconfigured drop box. The next screen will ask you to choose an object from the list. You may have to wait a minute or so for the list to load, depending on internet connection and speed (slowish wireless broadband dongle in my case), but when the list comes up, choose the object you want, and click add objects. This takes you back to the download objects screen (this is initially confusing, but is actually handy if you want to load objects from a different catalogue), but as you work back through the screens, you will see your new objects in the list. Daggerstab, take a bow. There are quiet a lot of new features that I won't go into. 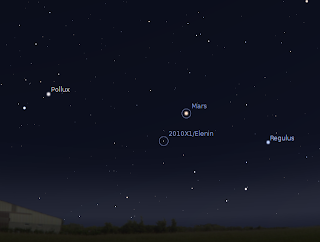 Suffice it to say that Stellarium covers a wide range of utilities that an amateur astronomer, educator or just interested person would find handy, without being a clunking behemoth. The other thing that I think is important is that the satellite plugin. They have updated the code and made it more accurate. They have also added satellite tracks. If you already had the satelliet plug-in installed in 10.5, when you install 10.6 it will automatically turn on the satellite tracks. I actually find this annoying, but it is dead easy to turn on or off in the confiuration menu (down the bottom), so you can have it on when you want. I give it 4 out of 5 Cepheid variables. What lets it down in my opinion is they still haven't produced a scripting manual. I love the scripting capabilities of Stellarium, and the new scripting language looks really powerful, but working out how to use it is really hit and miss. Still, that relatively minor quibble apart (I should get off my bottom and make my own guide) , Stellarium 10.6 is a fabulous program, go give it a try.